Thanks for stopping by today. 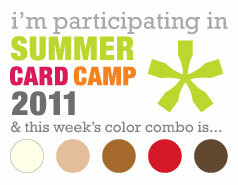 I'm a little sad that Summer Card Camp 2011 is ending this week; it's been a great class. This week these are the colors we are working with. For my card, I used one of Kristina's sketches. I love using geometric shapes and repetition in my designs. I stamped various images from the Yummy Treats set by Hero Arts using VersaMark ink and I heat embossed them with white embossing powder. I used a 3/4" square punch to punch our various parts of the images. I also used a VersaMark pen to darken areas on the cakes and cupcakes. Finally, I added some Diamond Sparkles by PSX and mounted the images with foam tape. I also added a little bling around the sentiment. Hope you are having a great weekend. The weather this week in Northern California was nice and cool. I didn't turn on the central air conditioning the entire week; it was heavenly! Here's a card I made for PSA Essentials using their Rosettas set of stamps (my favorite). This past week PSA Essentials partnered with Helmar USA adhesives to showcase both companies' products. This card started with this card design I cut out using black cardstock and my Silhouette digital cutter. I stamped the Rosettas designs on white cardstock with Memento Tuxedo Black ink and colored them in with Copic markers. I glued the white cardstock inside the cutout panels of the black card. I finished the design by adding gems to the flowers with Helmar 450 Quick Dry glue. I finished the card with some faux stitching. During the month of July, PSA Essentials is having a YouTube video contest that is open to USA and Canadian residents 17 years and older. You could win $200 worth of PSA Essentials products. See details here. Hi there! 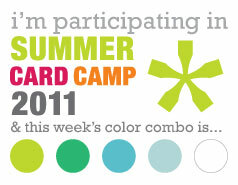 It's already week 3 of the Summer Card Camp 2011. These are the colors I used this week. 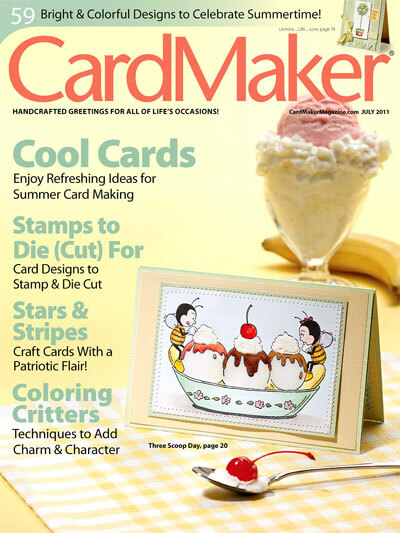 My card design started when I saw new Amy Tangerine American Crafts designs in the Silhouette Studio Store. I love this camera. I decided to make a camera-shaped card. My inspiration was a woodgrain camera like this one. All the cardstock and patterned paper is from Stampin' Up. I used a piece of vellum where the flash is located. I stamped a Papertrey Ink woodgrain stamp on the lens and heat embossed it with clear embossing powder. The red heart is a Stampin' Up stamp that I also heat embossed. The sentiment comes from Lawn Fawn and I stamped it with Chocolate Chip ink. I added some American Crafts brads and some baker's twine. Hi there! 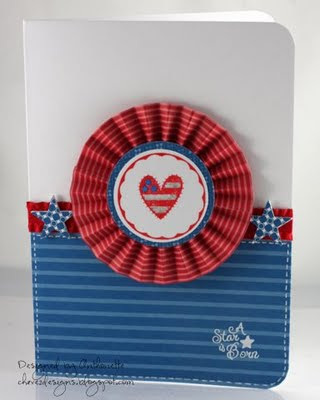 Today I'm posting a card for week 2 of Summer Card Camp. Here are the colors this week that I'm working with. I then stamped the same background stamp on the colored cardstock and also heat embossed them with white embossing powder. I cut out different words and added them to the card base with dimensional tape. It's the tail-end of our long holiday weekend here in the states. It's been a little too warm for me. Thank goodness for central air conditioning and a cooler evening today! Here's a card I made for PSA Essentials. It uses patriotic colors, but it is a masculine card to welcome a baby boy. The stamps come from the Country Home and Carriage stamp sets. This card was published on page 49 of the July 2011 issue of CardMaker Magazine. I just downloaded the online version of the magazine, since I hadn't seen the published card. PSA Essentials is taking applications for the new design team. Are you interested? Find out all the information you need here. PSA Essentials is also having a YouTube video contest that is open to USA and Canadian residents 17 years and older. You could win $200 worth of PSA Essentials products. See details here.